S'moreo's are a kicked up version of S'mores. Switch out the graham cracker and chocolate square for an Oreo cookie and Nutella. YUM! This is our new favorite campfire treat. You'll love it! 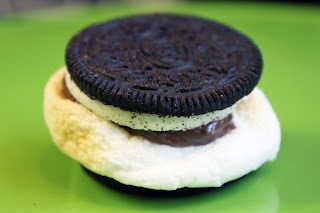 Carefully separate one side of the Oreo cookie and spread Nutella on one side. Roast a large marshmallow however you like it. I'm not really a fan of setting my marshmallow on fire until it's charred. I like to get the nice gooey inside and lightly brown on the outside. Place marshmallow on the other side and then slap the two together. 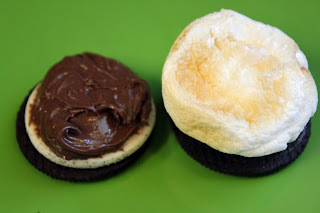 If you like Oreo cookies, you won't regret this tasty treat! 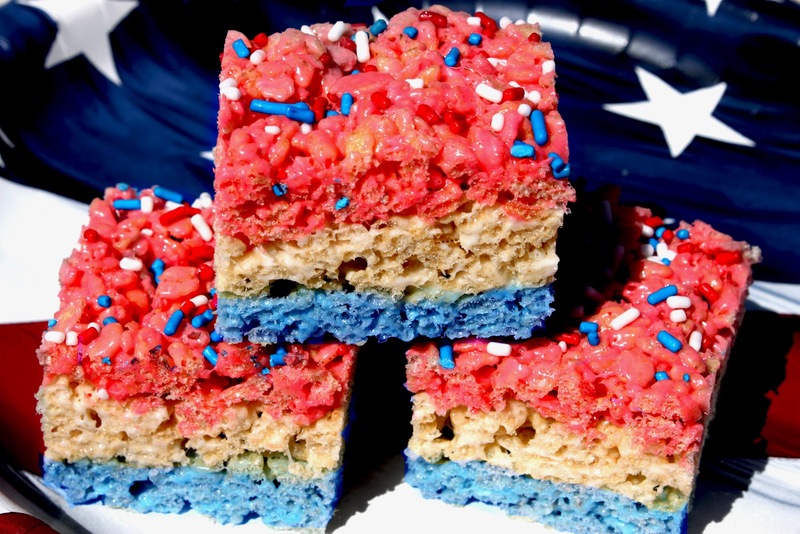 This is one of America's all-time favorite treats. 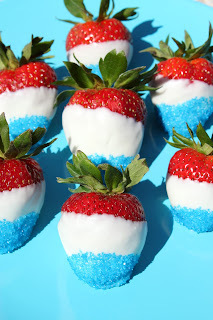 Mixing in a little food coloring really makes this dessert that much more festive. We ALWAYS double the recipe just so we'll have enough to share! Below is the original recipe but I tend to add extra butter and marshmallows for added gooey-ness! In a large saucepan melt butter over low heat. Add marshmallows and stir until completely melted. Remove from heat. Separate melted marshmallows and butter into 3 separate bowls sprayed with cooking spray. Stir in red food coloring to 1st bowl, blue food coloring to second bowl, and leave the 3rd bowl white. Add Rice Krispies cereal. Stir until well coated. Using buttered spatula or wax paper evenly press layered mixtures into 13 x 9 x 2-inch pan coated with cooking spray. Add sprinkles to the top. Cool. Cut into 2-inch squares. Best if served the same day. When Summer hits and you can find fresh ripe strawberries everywhere, I always think of eating this tasty snack. Dipping or stuffing; both ways work great! Wash and dry strawberries. If stuffing, core out the green stem and hollow out the inside a little. 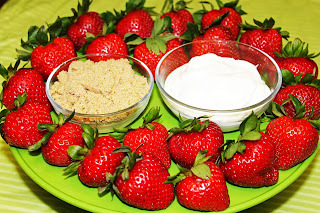 Spoon in sour cream and then top with brown sugar. I've been having a lot of patriotic feelings running through my blood the last few weeks. I love our country and the many people that serve to keep us safe. My favorite holiday is the 4th of July. I don't know if it's warm weather, BBQ's, family and friends, parades, or fireworks, but I love it all! This year I decided to get a head start on food ideas and make some things that I know my kids will eat. 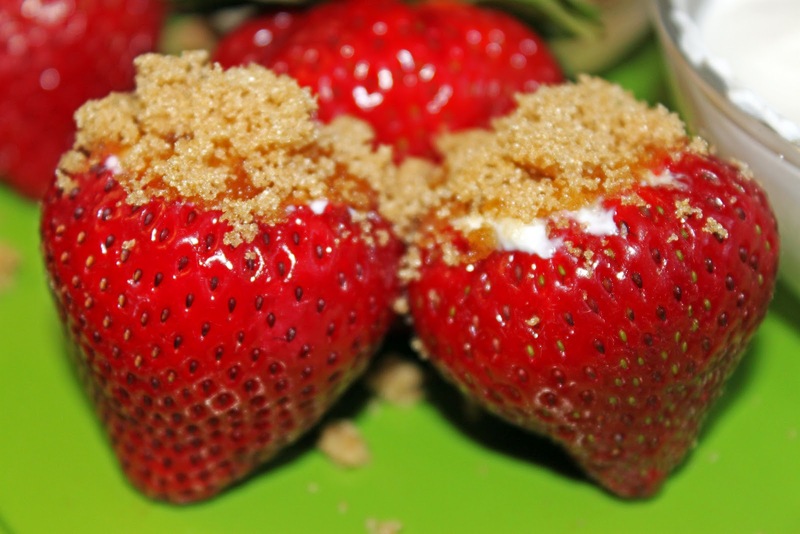 Wash and dry strawberries. (Make sure they are good and dry). Melt white chocolate. I just melt mine in the microwave at 20 second intervals. Stir in between intervals. It doesn't take long so don't over cook it! 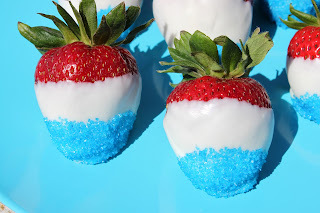 Dip strawberries in chocolate and then add blue sprinkles to the bottom. Lay on wax paper to dry. *UPDATE* We got the rock laid around the garden boxes and it looks great! The plants love their new home and I'm so excited that the project is completed! I'm surprised Jason hasn't already killed me for the unnecessary manual labor I've put him through. This is the third garden spot we've constructed but it's the best one yet. Our first year gardening was in this same spot w/o the garden boxes. We (I) couldn't control the weeds and it was just too big for our little family. 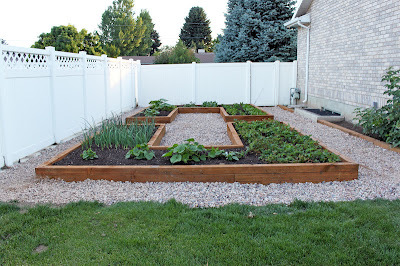 So we covered up the whole area with sod and built a smaller garden box which was great but it was quickly being taken over by strawberries which my kids love to pick and eat in the summer. So after much deliberation on how to solve the problems of weed control plus our separate interests of what we like to grow, Jason came up with these garden boxes and I'm so excited to see how the rest of it develops. We're planning to add rock around the garden boxes and maybe a drip system later. Last night the kids helped me plant onions, garlic, carrots and beets. Today we'll see what else we can get in it. 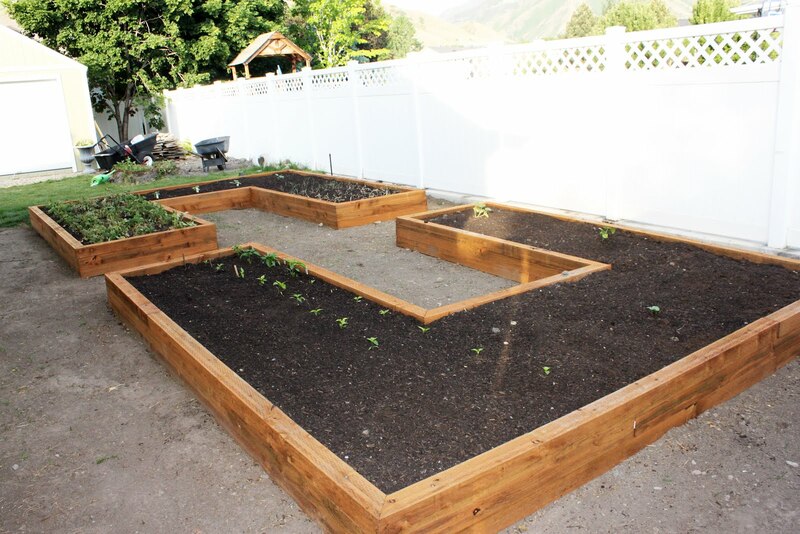 Even though the kids don't like some of the vegetables to eat, they love planting and watching them grow. I was getting a kick out of Brandon singing to the plants last night as he was watering. *UPDATE We got everything planted and are now working on leveling the ground for rock. I attended a bridal shower a couple weeks ago where we had these little appetizers. They are DIFFERENT, I will say that! The first bite I was a little skeptical trying to figure out how the flavors of goat cheese and tomatoes go with juicy watermelon. But then I had to try a second, then a third! Then I had to make my own the very next week. My husband had the same reaction. He kept staring at me through the first bite. But then he picked up a second, and then a third. I love the combination of these ingredients and I love that it's DIFFERENT. Slice watermelon into bite sized cubes. 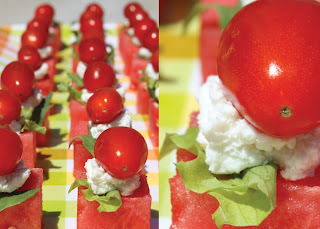 Lay a small piece of spring lettuce on top of watermelon. Spoon approximately 1/4 tsp. 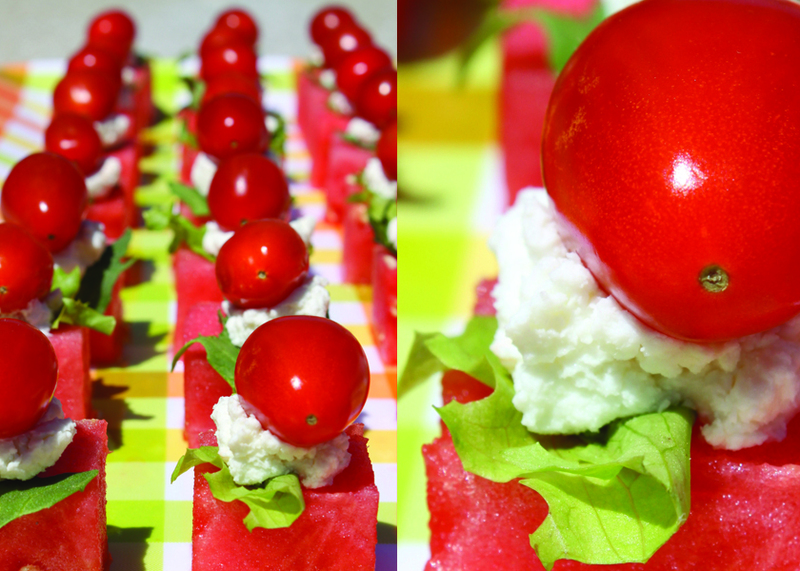 of goat cheese onto lettuce and top with a tomato. This is such a yummy drink for all types of occasions. 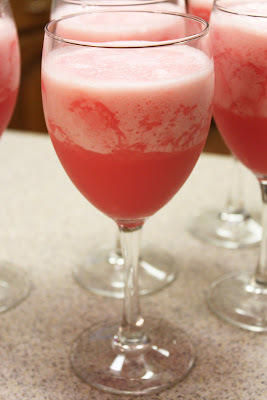 We always make it to go with our Valentine's dinner so we've dubbed it the Valentine's Punch! 2. In a blender, combine the sherbet with 4 cups of the lemonade mixture; mix until combined. Pour into individual glasses. Add the soda, stir gently and serve. I am always trying to find recipes to incorporate bananas into and trying to be a little healthier, I came up with this recipe. I try to have applesauce on hand to use as a substitute for oil, but you can certainly use oil in its place. In mixer, combine the first eight ingredients. In another bowl, beat the eggs, juice, sugars and applesauce. Stir into dry ingredients just until moistened. 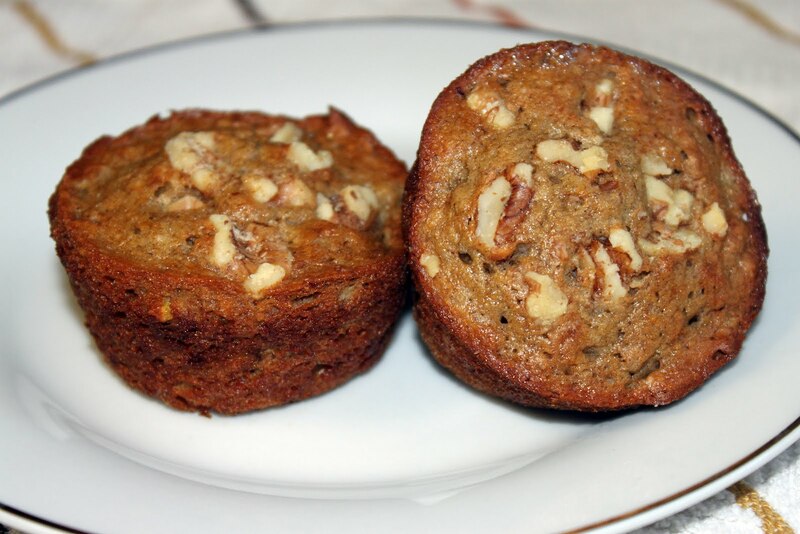 Fold in bananas and nuts. Fill greased or paper-lined muffin cups two-thirds full. Bake at 400 degrees F for 12-15 minutes or until a toothpick comes out clean. Cool for 5 minutes before removing from pans to wire racks. Serve warm. Makes approx 12 muffins. 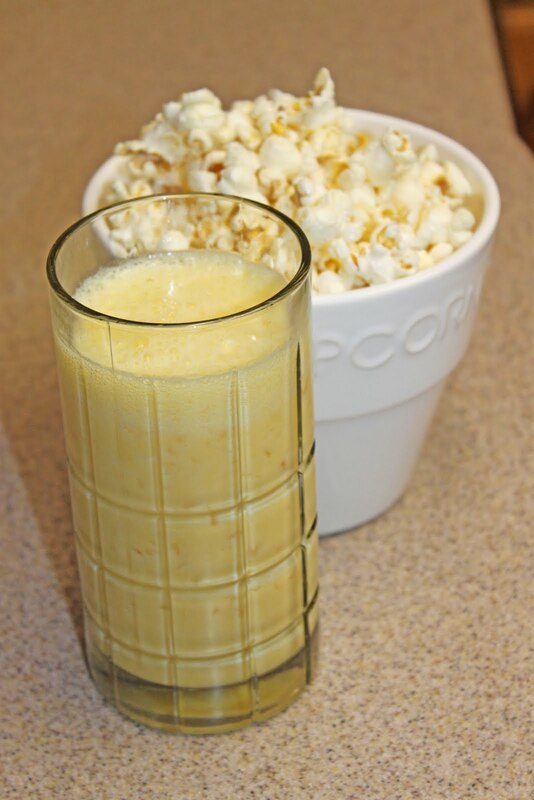 This recipe was a favorite growing up and it comes straight out of the good old fashioned Better Homes and Gardens recipe book. 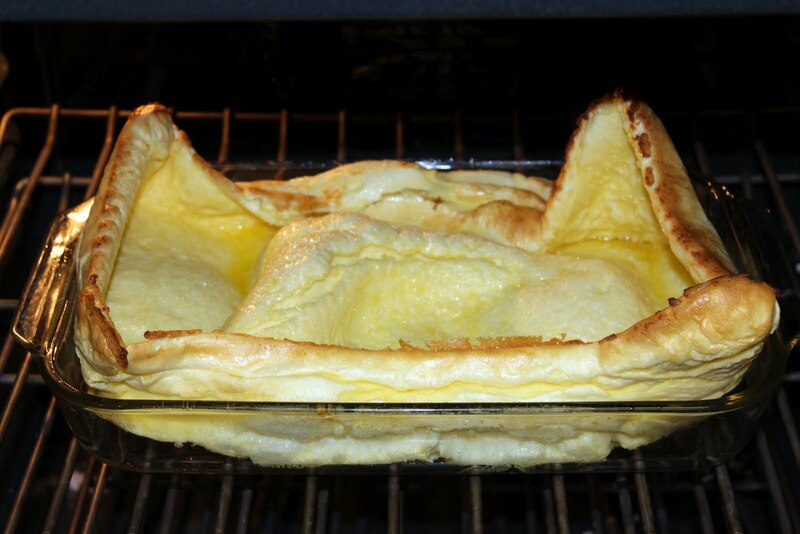 In the recipe book it is called a Puffed Oven Pancake. I've also heard it called German Pancakes but we think it's fun to call them Popeye Pancakes. I guess it's because they puff up really cool like Popeye does when he eats his canned spinach. 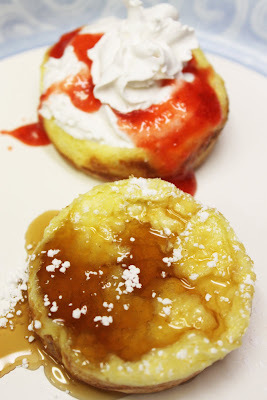 We usually bake the pancakes in a 9x13 dish but on occasion my kids think it's fun to have them baked in muffin tins so they have their own little servings that hold the toppings so well! My kids love syrup but my favorite is homemade strawberry jam and whipped topping. Delish! Place butter in a 10-inch ovenproof skillet. Place in a 400 degree oven for 3 to 5 minutes or till butter melts. In a medium mixing bowl use a wire whisk or rotary beater to beat eggs till combined. Add flour, milk, and salt. Beat till mixture is smooth. Immediately pour into the hot skillet. Bake about 25 minutes or till puffed and well browned. Top with syrup or fruit. 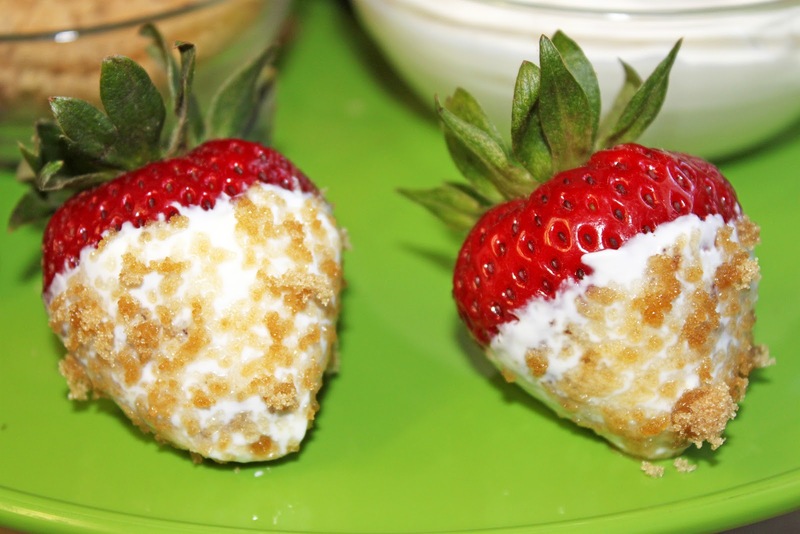 If desired, sprinkle with powdered sugar or top with whipped cream. Cut into wedges and serve warm. Makes 6 servings. *This recipe is for a 10 inch skillet but we usually double the recipe when using a 9x13 casserole dish. Doubling the recipe also fills 24 regular muffin tins. 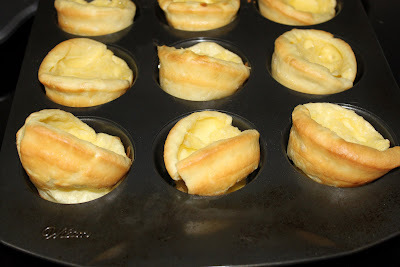 **If using muffin pans, I find the easiest way is to lightly coat with cooking spray while melting the butter in a bowl in the microwave and then drizzle a small amount of butter into each tin. Warm the pan in the oven for 2-3 minutes or until the butter is slightly bubbling. Make sure you don't burn the butter! Fill approx. 2 T. batter into each tin and then bake in the oven for 10-12 minutes. As I grew up one of the things I remember was spending most Sunday nights making popcorn and Orange Julius. To me, you can't have one without the other. They are just so good together!